Maryland (39-20) used small ball to force Indiana (34-22) into several defensive miscues in the seventh inning, igniting a four-run rally that spurred the Terps’ 4-2 win, earning them a berth in the Big Ten Championship Game. The win earns Maryland a trip to their second consecutive conference championship game. They lost to Georgia Tech 9-4 at the ACC Championships in Greensboro, North Carolina in 2014. This year, they will take on either Michigan or Illinois Sunday at 2pm ET at Target Field in Minneapolis, Minnesota. Maryland’s four-run seventh inning on Saturday began when Nick Cieri reached first on a dropped third strike, the first of many defensive miscues for Indiana. The Hoosiers would proceed to walk a batter, mishandle a bunt, boot a grounder and throw to the wrong base. Maryland would need just one hit, an RBI single by Kevin Martir, to take a 4-0 lead. Ryan Selmer turned in another excellent start for Maryland. Alex Robinson allowed the first two men to reach in the Indiana eighth, but Kevin Mooney got the final six outs to seal the 4-2 win. Mooney earned his third save of the Big Ten Tournament Saturday, becoming the first pitcher in Maryland baseball history to reach 30 saves. “We stumbled a little bit there in the eighth, but Mooney came in and does what he normally does,” head coach John Szefc said. Ryan Selmer started the game on the mound for Maryland and worked five and two thirds innings of scoreless baseball, inducing three double plays to keep the Hoosiers off the scoreboard. He only needed two strikeouts. “I think we have one of the best infields and outfields in the country and I think if I just put it in their hands and let them make the plays, then we’ll have a lot of success,” Selmer said. Rob Galligan relieved him and pitched a spotless inning and a third. Galligan pitched a scoreless seventh inning to pick up the win. 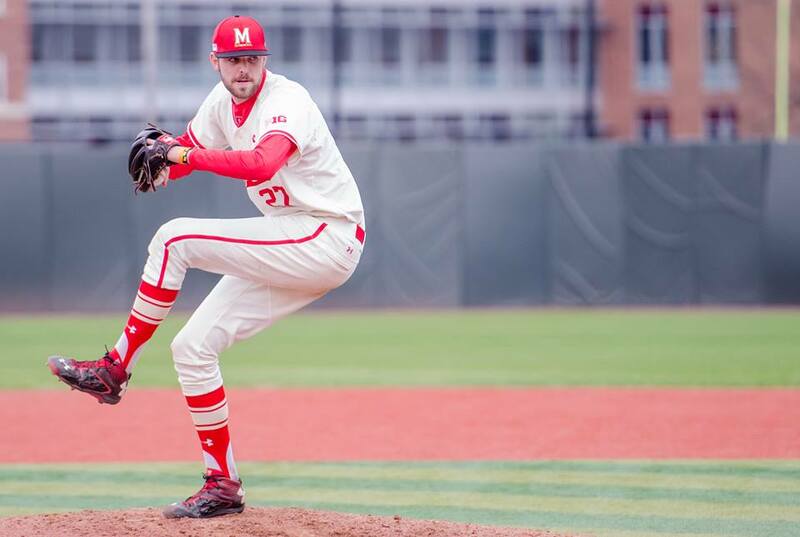 The Terps’ starting pitching has been outstanding in Maryland’s three Big Ten Tournament wins. Selmer, Mike Shawaryn and Brian Shaffer have combined to hold opponents to just two runs in 19 and two thirds innings, equating to an ERA of 0.92. Defense has been another positive trend for Maryland. They’ve committed only one error in three games, while their opponents have committed eight. Seven of the eight runs the Terrapins have scored in the Big Ten Tournament have been unearned. Maryland will take on either Michigan or Illinois in tomorrow’s Big Ten Championship game, and the Maryland Baseball Network will be live from Minneapolis to broadcast the action shortly before 2pm ET.